Many historians notoriously write about Prusia, that due to the absence of their statehood, chiefdoms, unity, and of course attributed to their barbarous paganism, have lost their independence and were wiped out. In fact, the Prusian structure of their society was above that time. The present brain washed societies, can not see that then was an other way of life. Against Prusai stood up the whole Europe, under the German leadership. An example without the precedence in the European history. The Prusai were unconditionally forced to defend their freedom, lasting more than half a century and finally their resistance collapsed. Despite the fact, that they were conquered, Prusians never surrendered. Many times in later centuries they continued the struggle for their dignity and freedom. Frequantly were in alliances with their neighbours, but at the end met only treason, their bravery over centuries terrified them. Prusai independent status was not of interest of anyone. All of them were free people, and such a status did not exist with their neighbours. Prusians never had the army, and yet were too strong for the Slavs and insurmountable. Their leaders, did not need political organization, among the Prusians enjoyed the highest respect and in the case of emergency mobilized all people to fight for their sovereignty, and were ready to lay down with their lives. Since when the Prusians were in combat ? First information we have, that in the year 635 Sveaking Yngwar of Uppsala invades Prusia. Supposedly from the year 650 to the eleventh century, notoriously do the same the Vikings. Using Wikipedia it should be clarified the definition of the word Viking; "The word is derived from the name Viking seafaring with arms: " viking "word is initially combined with Old Norse vik (bay) or Old Germanic vik (port village). Later, however, noted that the word was coined in the eighth century (before the period of Viking attacks on the coast of England, Ireland and France) in the form of the Old English "wicingsceada" and antiquated "witsing". Since then began to combine the Viking name with this particular area of language, pointing to the Old English "wic" which means trading camp. The first time the term was used long before the era of the Vikings, to the Saxon settlers (Saxon). Viking Norse feminine noun means a trip overseas. Appeared in runic inscriptions Viking and medieval later writings (eg. A fixed expression fara and Viking "embark on an expedition"). In later texts, as Sagas of Icelanders, the phrase "go on viking" means the part in the expedition plundering or piracy. Inferred from the Old Norse masculine noun víkingr, referring to sailors or warriors participating in expeditions overseas, appears in poetry Skaldi and rune stones, found in Scandinavia. Before the end of the Viking Age did not bring a negative connotation. Regardless of etymology, Viking was used as a determination of the activity and related persons with it, without regard to ethnicity or culture." The word Viking for Polish science is equivalent to the Scandinavian, in fact Slavs in southern-western Baltic were among very brutal Vikings. The two Prusian ports were very well guarded and any time the arrival of the intruders could be spotted very quickly. So, without doubt Vikings also concerns Prusai, they must have been in this business. None of their ports were taken over by intruders. Port Truso was located in the depths of the Vistula lagoon. Intruders before they could reach the port previously would have been spotted by a number of settlements along the coast. About the many of the settlements we know from Wulfstan the English traveler in the year 890. The Prusians were not only excellent sailors, but also in marine craft expert boatbuilders. Well known event, the Prusian merchant escaping from Curonian pirates chase. Wiskiauten second port, on the meander of the river Niemen with the defense of the Kaup fortress, protecting from intruders and pirates of the Baltic Sea. The Scandinavian chronicle never had enrolled, that any of these ports was ever captured. The noteworthy Ruthenian manuscripts says of clashes with Prusians, in this case most probably were with Jatviagans, for them in those days there was no power strong enough. For 200 years, fourteen Polish monarchs plundered Prusia, always under the pretext of their paganism. The Prusian warriors at Gniezno cathedral door. About 1170 year. The work of Kazimierz Ascik, footnotes "On military Prusians in the V-XIII century" author cites A. Kaminski, "is of the opinion that before the period of armed party to convert the Prusians, the Polish-Prusian and Polish-Jatviagans wars, were the aggression on the Polish side. The reason for this phenomenon sees itself not only in the political dispersion of Jatviagan and Prusian people, but also in the being of good nature of the Prusians ". Slavic process in conflicts with Prusians initiated Boleslaw the Brave, and he was credited with the first expedition to Prusia in the year 1009. The Prusai in combat, fought from the ambush. 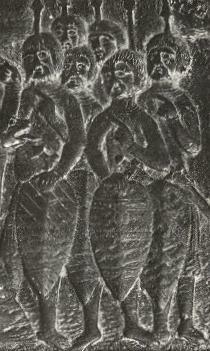 Infantry or if one prefers militia, as shown at the door of the Gniezno Cathedral, year around 1170, warriors were with oval shields and spears. Single blade or double swords were used, decorated, inlaid with copper, silver, also happened with gold. Infantry raged short clubs, tipped with bronze knob or bloated lead. Warrior had about seven clubs empowered at the waist. From the early youth, boys practiced throwing with clubs. This was the prototype of today's grenade with dynamite. Tacitus in the first century AD describes the Prusians with words: "Seldom use iron weapons; mostly clubs. They cultivate fields more diligently, than ordinary lazy German. Also rummage in the sea, and they all are finding through the shallows, indeed at the very edges, amber, who they call glesum "(P. Cornelia Taciti, De origine et situ Germaniae, ed. E.Fehrle, c. 45, translation AS Naruszewicz, Warsaw 1804. ". Spears, long rods with the completion of a club, fan-axes on a long handle. Melee each have a long or a short knife, worn at the waist. Helmets were conical, mostly from the east of Kiev imports. Were in the use the arches, in battles against the Teutonic Knights used a crossbows. Certainly, as some say, they did not fight a wedge formation tactic, because the lack of their numbers Prusians did not fight an open battles. Also used the tactic of siege. The Prusai arms and their way of fighting differed little from neighbours, was adapted to their densely forested land in which they lived. Arming depended on wealth. Each Prusian, it was his duty to care for armour equipment. For fast movement were without heavy armour and armoured horse. The armour was made of thick leather, and sometimes in the appropriate places strengthened with metal blades. Riders were mostly commanders and their closest entourage. The riders in the thicket were of little efficiency. Different during the uprisings when had to move to distant places. To bridge the gap, agility, change tactics, Prusians riders participated. Weapons did not deviate from the invaders, did not lack with horses, horse breeding was common among them. "Besieging brick Teutonic castles like Kreuzburg in Natangia, Bartoszyce and Wiesenburg in Bartha and Königsberg (Tuwangste), Prusians quickly took over from their enemies siege tactics, using storming towers, moving to the walls, machines tossing stones and fire and battering rams to tear down the walls. From trips of besieged castles crews, defended themselves in the field reiforcement, to protect the unexpected counteract from the locks and allow for better control of the entire area. Thanks to that the besieged could not contact other castles and bring food or help. Of course, that such a powerful fortresses as Königsberg, Elbing, Balga, Rehden, having a group of walls, numerous crew and large supplies of food, even a few years durable siege would not allow to be captured by the Prusians. At the siege of Konigsberg Prusians used the latest in the contemporary art siege, realizing that getting a fortress can determine the outcome of the conquest. In order to obtain Konigsberg Prusians from the north and south belted castle with strong fortifications. At the mouth of the river Pregel (Preglis) Prusian ships patrolling the river were blocking any supplies, pick up food from the sea. The bronze heads fixed to short Prusian clubs. 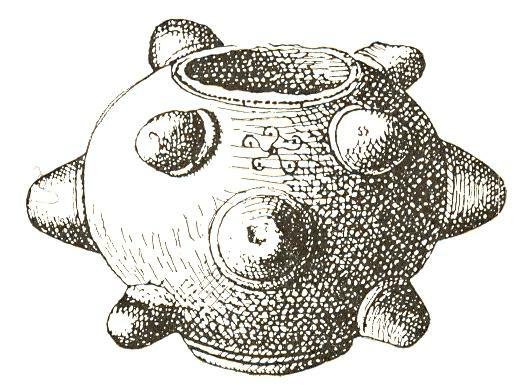 Ancient grenades. More dangerous than arrows. Throwing them boys trained from an early age. If the Prusians were not taken by surprise, women, children and elders were quickly moved out of their homes to the defensive places hidden in thickets, while adult men with youth hunted invaders until they removed the threat. The role of the place in the thicket settlements was to protect families. The Prusian contact with Slavic Piasts dynasty also had a completely different character of tactical alliances. The Slavs alliances concerned with western Prusian. The twelfth century, concluded an alliance aimed at the Mazovia and Pomerania. Another time, the Prusians took part in the war waged with the German emperor Frederick Barbarossa.